The US economic data begins to trickle in slowly. Today, the reopened Census Bureau reports on orders and shipments to and from US factories dating back to last November. New orders for durable goods rose just 4.5% year-over-year in that month, while shipments gained 4.7%. The 6-month average for new orders was in November pulled down to just 6.6%, the lowest since September 2017 (hurricanes). 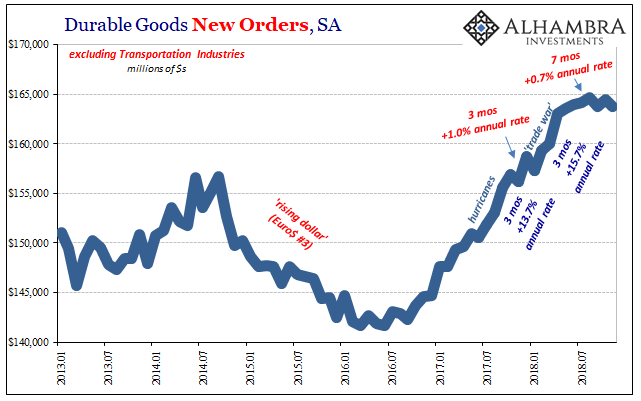 Even though the data is several months behind, it shows very clearly the state of the goods economy just prior to the market “fluctuations” that ended last year. Whatever economic momentum there may have been in late 2017 (for whatever weather reasons) and early 2018 (for whatever political reasons), the last half of last year was without any. Seasonally-adjusted, durables orders are down about 0.5% since August – a three-month losing streak (and counting). Over the last seven months of current data, this forward-looking indicator has been flat; no growth at all. A few months without any gains can be related to a number of possible factors including weather (and I’m pretty sure the Polar Vortex of January 2019 will be a heavily cited influence in economic analysis just ahead), but seven months or more than half a year is an extended growth vacation that can’t be so easily dismissed. That’s particularly true given that the same struggle is being picked up beyond the durables sector. The Census Bureau today also updated figures for overall factory orders; the level of activity in all manufacturing industries, both durable and nondurable goods. Factory orders had surged in August and September last year, some of which related to aircraft orders handed to Boeing. 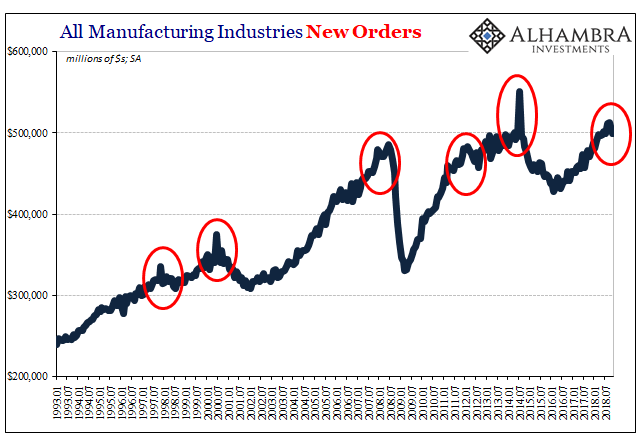 In October and November, they sank back so that factory demand was lower in November 2018 than it was in June 2018. Furthermore, this sort of behavior has marked each and every economic inflection since the data series was begun in 1992. 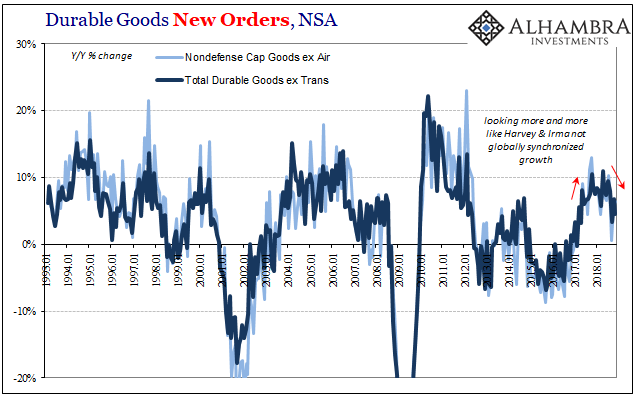 From the Asian flu downturn to the dot-com recession, and then the three completed eurodollar squeezes (so far), for some reason, there is a rush to get in factory orders (aircraft and nondurables) prior to the economy, in general, falling off.